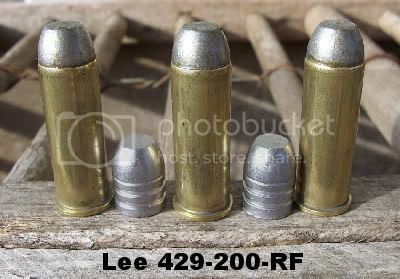 A couple weeks ago I had finally got around to shooting my first cast bullets with the Lee 429-200-RF through my Rossi 92 chambered in 44 Magnum and had experienced some serious pleasure in doing so, but I also experienced serious leading. Im also in the process of developing a load for my dads Rossi 92 chambered in 357 Magnum using the Lee 358-158-RF with no leading whatsoever. As far as my Rossi 92 goes I thought for one it was lube failure along with unburned powder due to the charge being to light for the bullet weight. It may have been lube failure but it was something else as well. I had been needing to slug the bore on my 92 to see what the bore diameter was because when using cast bullets proper fit to the bore is essential. I had found out previously on the leverguns forum that SOME of the Rossi 92's chambered in 44 Magnum could very likely be overbored and sure enough mine was. I have several options on how to make the mold the correct size but havent made up my mind yet on what to do. 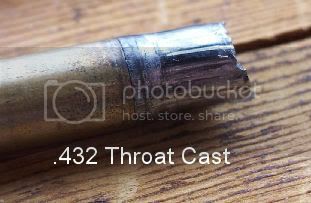 I finally made a throat cast and to my surprise it measured .432! No wonder im getting major leading using a .429 diameter cast bullet with a .432 diameater bore. 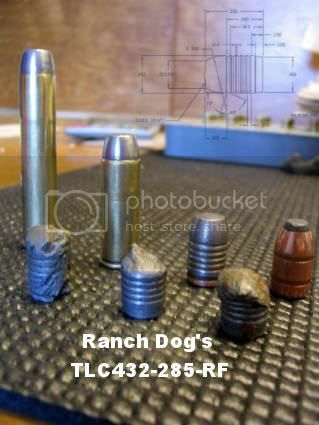 Pictures of the TLC432-285-RF courtesy of Ranch Dog. Thanks again Michael!!! But luckily I got in on a group buy on a custom Lee six cavity mold for the 44 caliber. 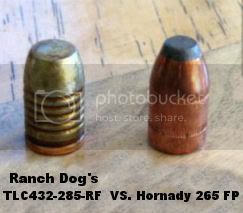 The Ranch Dog TLC432-285-RF which I believe will do nicely for my bore size. From the game this bullet has taken it seems to be a flat faced killer. This is a tumble lube and gas checked designed bullet and I cant wait to get my hands on this mold.